Top Christmas Travel Tips 2018 | Making Your Commute Home Better! It can be hard to feel festive while travelling at Christmas, while dealing with a plane full of either a) stressed out families b) drunk homesick sons . To arrive at home feeling cheery, well organised and ready for the Christmas season, here are our tops tips for travelling at Christmas. Seriously, not a sales plug, please remember that everyone is trying to get home for Christmas and our buses will be packed. The busiest days so far are December 21st, 22nd and 23rd but all days over the season will be busy, and while we have lots of extra seats available, we anticipate they will sell out quickly. We have extended the 15% online discount for another week (up to 9th December). Book here. Keep in mind we are closed Christmas day, Boxing Day and New Years’ Day with restricted services Christmas Eve and new Years Eve. 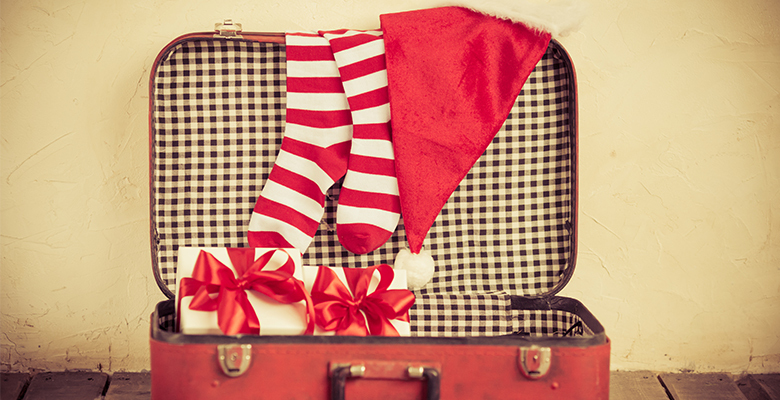 Travel light and do your last minute shopping here at home. We have some great picks on our blog (shopping link) and vouchers from outstanding restaurants make a great gift. £50 from one of our favourites (Walled City Brewery) goes a lot further than your swanky Manchester hotspots! Everyone has the exact same black, cabin friendly size roll on as you do. Mark it with ribbon, straps and your name and address. Don’t be surprised or dismayed at how long it takes to get anywhere at Christmas. Allow extra time to get your train, your taxi and your bus. You will not arrive at BFS at 1940 and get the bus at 2000. Allow extra time for security, for check in and for possible delays. Put Chris Rea Driving Home for Christmas on your playlist, put your earphones on and think of your mammy’s roast potatoes and gravy. Crayons are so last century. Charge every single device you have and hog every possible plug. You don’t want to run out of power just as your little darling finally sinks into a Paw Patrol trance. Avoid fizzy, chocolate vomit- stick with crackers and water bottles. Haribo if you’re in desperate need.